Posted by Jasco on July 15, 2015 at 7:00 AM. Filed under Around the Home . 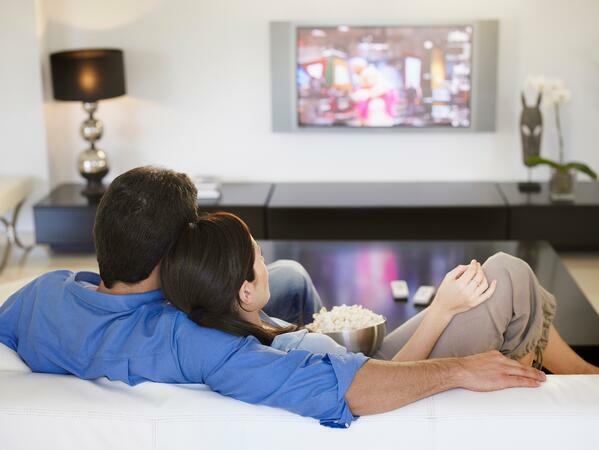 4K TV technology is gaining more and more buzz and is the latest marketing trend among manufacturers, but what is it? Do you really need a 4K TV? Looking at the facts and knowing what to expect if you purchase a 4K TV will help you decide if you truly need one. What does 4K really mean? At its simplest definition, 4K means that there are more pixels than standard HD. Standard HD is 1080 pixels high, while 4K is about 4,000 pixels wide. We say “about” because 4K and Ultra HD are used interchangeably at the consumer level when they are actually different. 4K is a term used in the professional cinema industry to describe a pixel resolutions of 4096 x 2160. Consumers on the other hand don’t have a screen as wide as the pros, so the resolution ends up being 3840 x 2160. So, the next time you are walking down the TV aisle and see one TV described as UHD and another as 4K, just know it is a marketing gimmick and for you they mean the same thing. Now, will all those extra pixels really enhance your viewing experience? Yes and no – it depends on several factors. First of all, just know it won’t be as big of an impact as when you went from SD to HD. This is because at the time, not only was there a big jump in resolution but also in screen size. Now, we are only looking at a jump in resolution, while screen sizes are staying relatively the same. The biggest factor affecting how much you will notice a resolution improvement is how close you sit to your TV. To see the improvement you have to be sitting pretty close to your TV, and I mean really close. The further away you sit, the bigger the TV set you will need to see the difference, and the bigger the TV, the bigger the price tag. 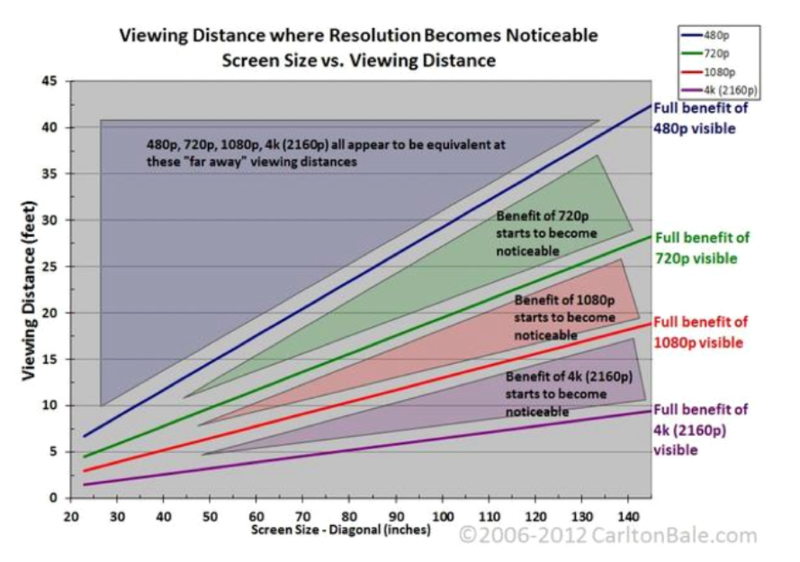 Below is a chart to help you determine the size of TV you will need to see the benefits of 4K based on how far away you sit from the screen. The other big consideration with 4K/UHD TVs is content. Currently, not much is being produced in 4K/UHD resolution. The major reason for this is because of file size. 4K content contains four times the information per frame compared to HD, so it becomes difficult to get the content to you. Broadcast has just caught up to the HD programming, and streaming bandwidth will definitely be an issue. However, 4K content is slowly coming. Netflix has a few shows in 4K (House of Cards, Breaking Bad, Blacklist), and Sony’s Video Unlimited 4K service has more than 70 films and TV shows to rent or purchase. The Blu-ray Association has also announced that the 4K standard is on its way and we can expect to see 4K movies in time for the holiday season this year. So, should you get a 4K/UHD TV? Eventually, yes. There are several factors to consider when deciding when to purchase a 4K TV, but just know this isn’t the 3D fade. 4K is the here to stay and if you purchase now or later is entirely up to you and your budget. If you love being the first of your friends to have the latest technology then go ahead and get a 4K TV, it is an investment in the future. Make sure to look for devices that support 4k functionality. All GE High Speed HDMI cables are designed to provide lossless surround sound and a crystal clearHD picture for 4K,UHD, HDTV, 3D, cable, satellite, Blu-Ray players and more. Making sure the TV has a USB 2.0 ports is another important feature to look for when purchasing a TV from a top-tier manufacturer. This will be critical in delivering 4k content in the future. However, if you have a HDTV now and don’t want to upgrade, no problem, your HDTV will still be great several years down the road. Jasco Products has a wide selection of HDMI cables that support the transfer speeds needed for 4K/UHD. Shop online for the full line of GE branded connectivity accessories.